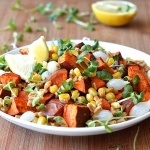 This Roasted Sweet Potato and Farro Salad is light, yet very satisfying. It’s sweet, savory and nutty all at the same time. 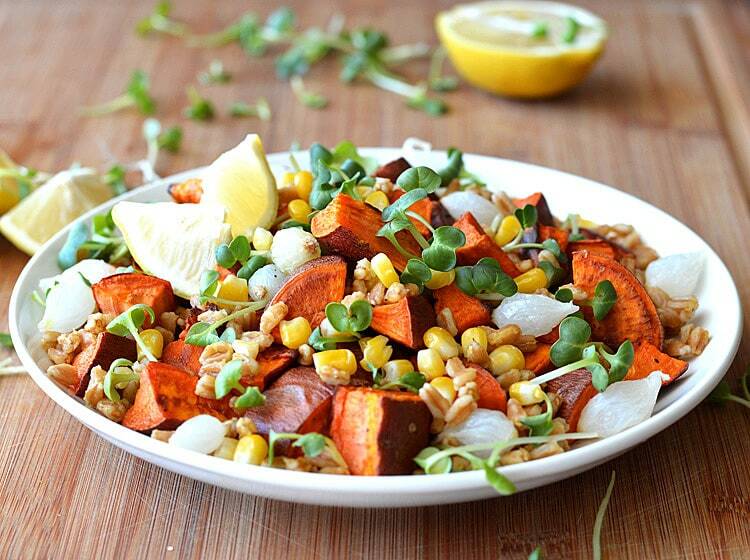 Roasted sweet potatoes are tossed with cooked farro, sweet corn and pearl onions. We topped the salad with radish sprouts and a vinaigrette of roasted garlic, lemon juice and oil. If you can’t find radish sprouts, use microgreens or parsley. It’s simple, yet stunning. The radish sprouts give this dish a pretty presentation making it a lovely dish for serving to guests. Wash the sweet potatoes well, as we will be leaving the skins on. Slice lengthwise and cut into large diced pieces. Try to keep uniform in size so they will roast evenly. We sliced just the top off a whole head of garlic, drizzled with olive oil and seasoned with salt and pepper. Then wrap in foil and roast along with the sweet potatoes. They will be sweet and tender and you can just squeeze the cloves right out. We only used three cloves for the dressing but the remaining cloves make a great spread on crostini! Roast sweet potatos until fork-tender. If you'd like, you can also roast the corn and pearl onions. Just keep a close eye as they will cook much more quickly than the potatos or garlic. Cook the farro according to the directions on the package. Allow to cool. Allow the potatos to cool slightly enough to handle. 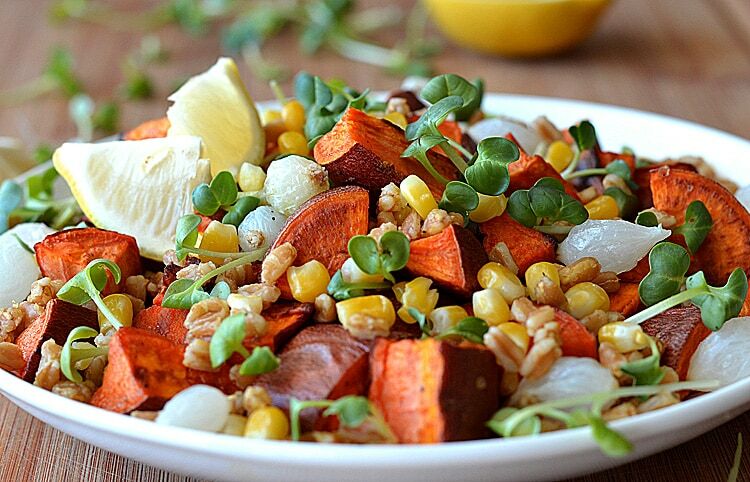 Toss together the sweet potatos, corn, farro and onions. Serve topped with radish sprouts and the garlic lemon vinaigrette. Taste for seasoning. Add salt and pepper, to taste. This looks like a wonderful recipe! All of the beautiful flavours of fall with sweet potatoes, and the nutty farro would give it a substantial chew. Thanks for sharing!